Having a turkey deep fryer means having a possibility to cook an amazingly delicious, crispy with golden outside bird. Moreover, for a medium sized turkey it will take only about an hour to get ready. Usually, people fry a turkey for holidays especially such as Thanks Giving day and this tradition came from Southern America and is now becoming more and more popular among people from all over the globe. Not everyone is a professional chef or a cook to make a bird in an oven but with the Turkey deep fryer there will not be any problems to cook it. 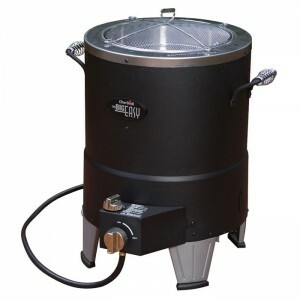 The Char-Broil Big Easy is an amazing turkey fryer with a good size, reasonable price affordable for every single person and, of course, high-quality. Consequently, there are no reasons to not put this model on the first place. This is a middle sized turkey fryer that can take up to 16 pounds bird. It takes about 8-10 minutes to cook every pound of it. Knowing this fact, it is easy to calculate and understand that it will take about 140-160 minutes (from 2 hours 20 minutes to 2 hours 40 minutes) for the turkey to be ready. Yes, this Big Easy model isn’t the fastest thus it is much faster rather than an oven which takes more than 3 hours to fry a middle-sized turkey. The biggest advantage of this fryer is the point that one shouldn’t deal with oil as it is sometimes dangerous if it starts splashing etc. The second plus is that the bird will not absorb oil and, therefore, will not be fat in calories and that is a significant factor for some people. 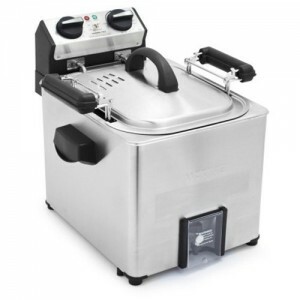 The fryer is of a very nice design – it is cylindrical. The inside of it is made of stainless still and the handles always stay cool (no need for a towel etc). 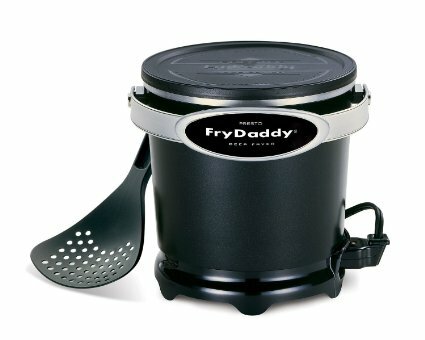 The most surprising fact about this fryer is its price. Of course, considering that this model is at the top 3 ranked, one starts thinking that it should be quite expensive. But NO! Its price is just a little bit up of 100 dollars. Though if you do a careful research on Amazon.com and find it on sale, it will cost you less than 100 dollars. It is a great value for money that is available on the market. Apart from that the positive recommendations and feedbacks given by people will persuade you to stop your choice exactly at this Char-Broil. More than 500 users on Amazon.com rated it and, as a result, it has got 4.6 out of 5.0 stars. It means that 79 percent gave it all 5.0 stars. As one sees from its name it is aimed at cooking huge turkeys, to be precise, the ones that weigh more than 20 pounds. It is a real culinary monster. This stainless steel monster is also very powerful – 1650 Watts. Due to this fact the oil will be hot in less than 30 minutes. One more its advantage is the possibility to cook it inside whereas sometimes one needs to deep fry a turkey outside. And it is not very nice especially when the weather is cold and rainy. This model has a basket where the bird should be put and later lowered and taken off. The grip of the basket is very comfortable and it is especially important when it is needed to drain the oil. The drain valve helps to maintain the unit- clean it. But that’s not all. One more its plus is the time is takes to cook a turkey. If the turkey is about 14 pounds it will take less than 1 hour (55 minutes). And it is amazing as during this time you can do whatever you want – deal with other dishes or simply talk to your family. Despite the fact that this fryer is counted for cooking large birds, its measurements are the following – 15.6”x18.5” length, width, and 15.2 height. And one more pleasant fact – the rating. Amazon users and trusted customers rated as 4.5 out of 5.0 stars which is 70 % of 5.0 stars. 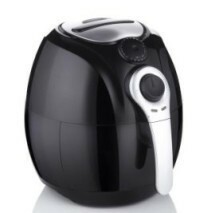 This Waring Pro fryer/steamer is really powerful – 1800 Watts. Thanks to such an amazing power it is capable of getting the turkey of 18 pounds ready in over 1 hour. But that’s not all, apart from its high-quality, nice design, it also has a unique feature – rotisserie, which means that while the cooking process it will use less oil than any other fryer and consequently your bird will be low in calories. All these reasons make the TF200 so wanted by the customers. There can be even a few ways of using it. The first one is using it as a turkey fryer in the cooking basket or turkey fryer on the rotisserie (using less oil). The main principle of the rotisserie is to spin the turkey from time to time so that every inch of it is crispy and of a golden color. Though be careful with the weight of the bird. Using a rotisserie, the bird can’t weigh more than 18 pounds. 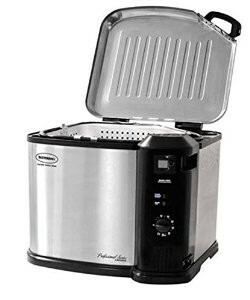 When taking the rotisserie off, the TF200 can also be used to fry any kind of foods. And when you are done with frying, what about using it as a steamer? Good idea, isn’t it? To use the Waring Pro as a steamer, one should just fill it with water instead of oil and here you go – the massive beast is at your service! Of course, when opting for the fryer or any other unit the brand does matter and the Waring always equals top quality, performance plus stainless steel material which means longevity. The manufacturers give it a 5-year limited warranty on the motor. Moving to the maintenance of this professional rotisserie, fryer and steamer at the same time – it is very easy as the oil is at the very bottom and it is not difficult at all to empty it and later wipe. There is also a timer and temperature which let you know about the condition of your turkey and its temperature. Above all, a thermometer can be used to check the turkey before cutting it into pieces. 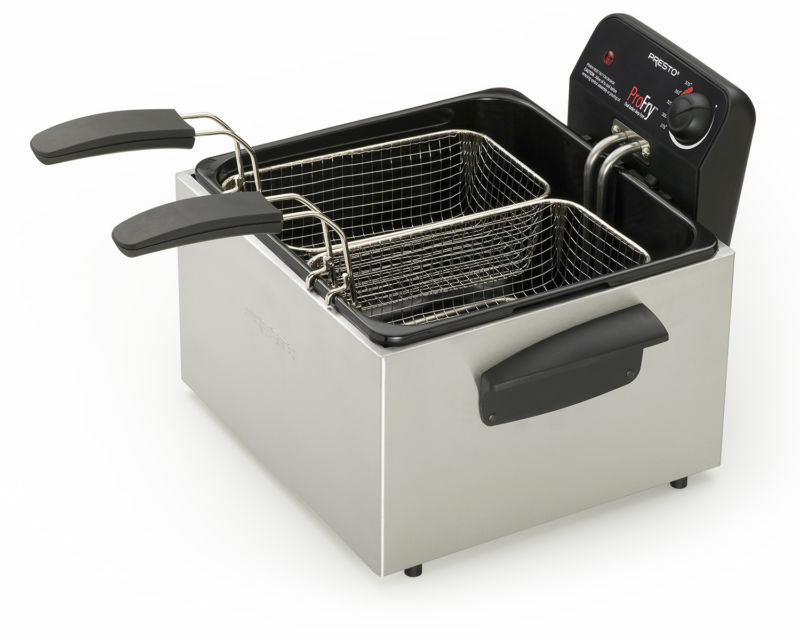 This model is a bit more expensive than the previous 2 but don’t forget that it also has more features and can be used as a fryer and steamer. Nevertheless the best and lowest price you will always find on Amazon.com. 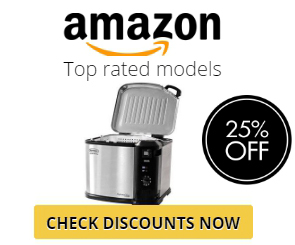 The Amazon trusted customers are extremely happy and absolutely satisfied with this cooking fryer and, therefore, has rated it as 4.3 stars out of 5.0. 70 % of people gave it all 5 stars. All the customers highly recommend. Air Fryer Guru Copyright © 2018. All Rights Reserved. airfryerguru.com is a participant in the Amazon Services LLC Associates Program, an affiliate advertising program designed to provide a means for sites to earn advertising fees by advertising and linking to amazon.com.